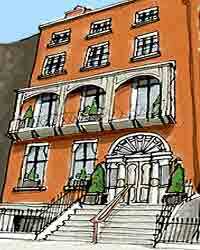 Brownes Townhouse hotel in Dublin, Ireland cheap Dublin accommodation. Located in the heart of the city centre, Brownes Townhouse is famed as one of Dublin's and Irelands most magnificent boutique hotels. The hotel offers a number of fabulous en suite rooms and suites, and excellent value for money from a hotel which is well-known for its exceptional high standards. For pampering at its best Brownes Townhouse offers amazing en suite bedrooms and suites. All individually designed to offer the guest superior luxury and style. The excellent facilities in all rooms include air conditioning, remote control multi channel televisions and ISDN direct personal phone and fax lines in all rooms. There is the added luxury of a private resident’s dining room. An all out effort is made to ensure that each guest will enjoy a memorable visit. The air conditioned elegant Bistro offers the guest a memorable dining experience. Dishes are prepared to the highest standards from the freshest ingredients. The wide-ranging menu from Seafood specials to lava rock specialty grills are designed to cater for all taste. The extensive wine list offers the very best European wines And for that special date or anniversary there is a superb champagne selection from Reims in the heart of champagne country. Located on St Stephens Green, just a two minute stroll from Grafton Street with its exclusive shops. The National Gallery, Government Buildings and The Natural History Museum are just five minutes away. The hotel is just a short saunter from Temple Bar with its enormous and varied selection of Bars and Restaurants. The Olympia theatre which is very a popular concert venue is close by.